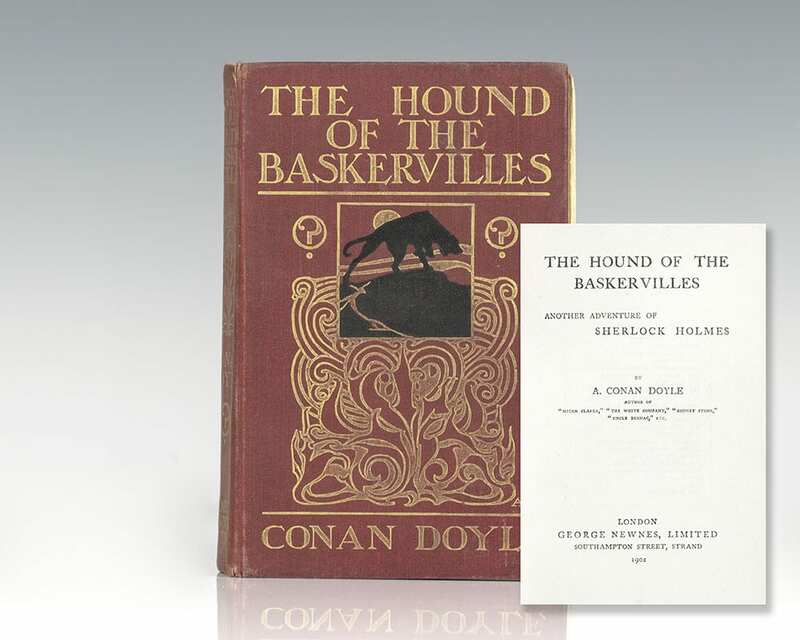 First edition, first issue of the third Sherlock Holmes novel, and widely considered as the best of the series. Octavo, original black and gilt stamped pictorial red cloth. Illustrated by Sidney Paget. In excellent condition with some light rubbing to the spine. A very nice example. 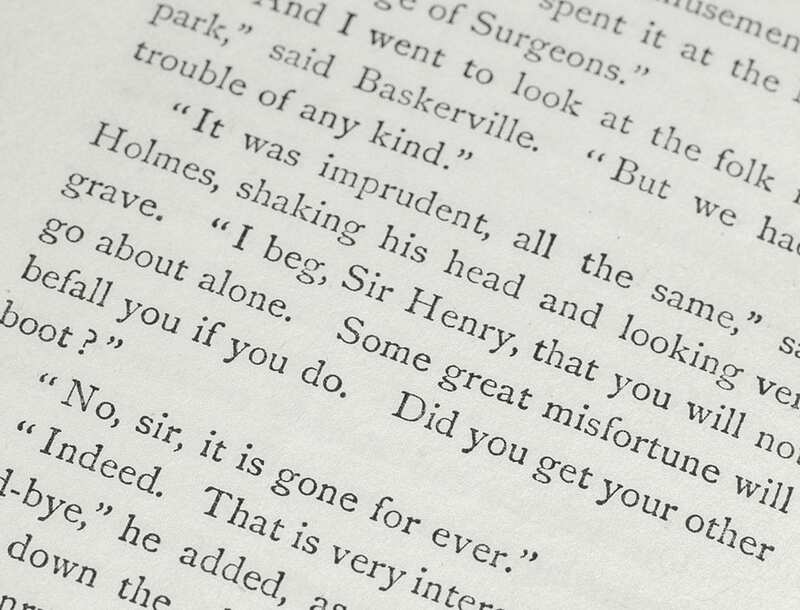 Although Conan Doyle killed off his most famous character by sending Holmes over the Reichenbach Falls in a struggle with Professor Moriarty in “The Final Problem” (December 1893), readers demanded the sleuth’s return. 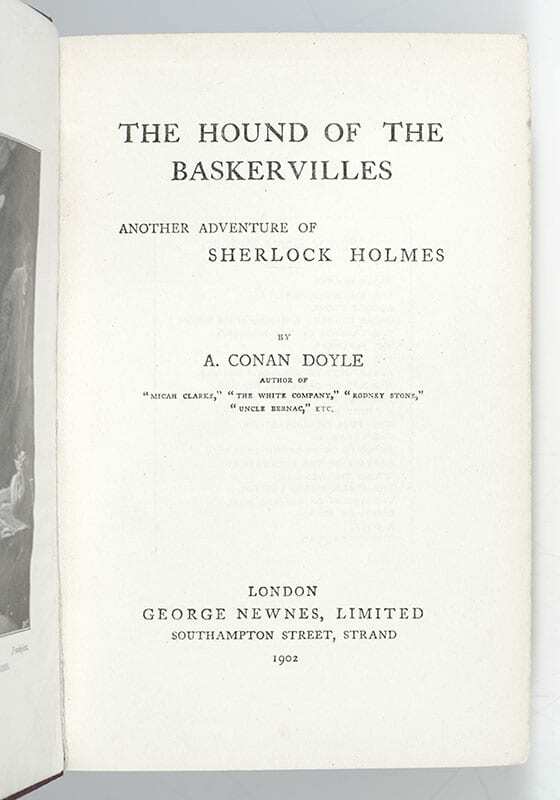 The author obliged with this, the third— and still considered by many the best— Sherlock Holmes novel, carefully positioned on the title page as “another adventure” of Holmes. “But,” as Howard Haycraft notes, “the seed of doubt was planted”; while the novel proved an immediate success, readers pressed for more. 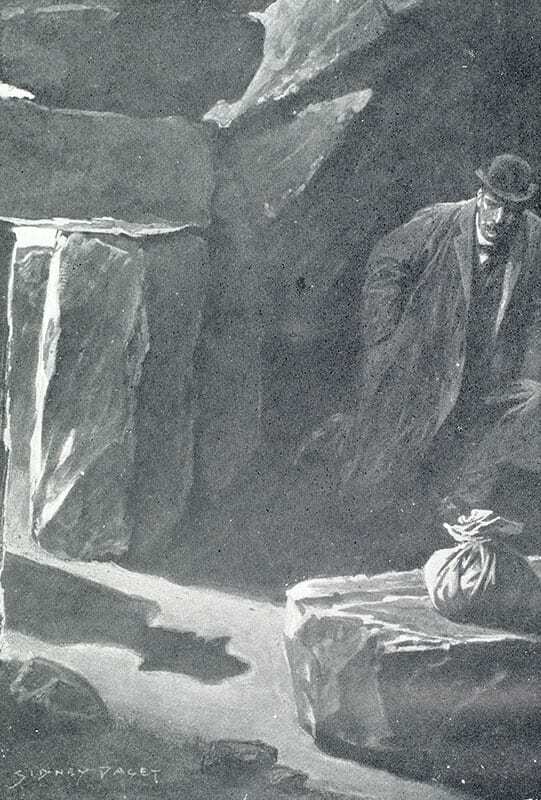 Conan Doyle finally relented and engineered Holmes’ “resurrection” in 1903. The Hound of the Baskervilles remains “one of the most gripping books in the language” (Crime & Mystery 100 Best). “The supernatural is handled with great effect and no letdown. The plot and subplots are thoroughly integrated and the false clues put in and removed with a master hand. The criminal is superb… and the secondary figures each contribute to the total effect of brilliancy and grandeur combined. 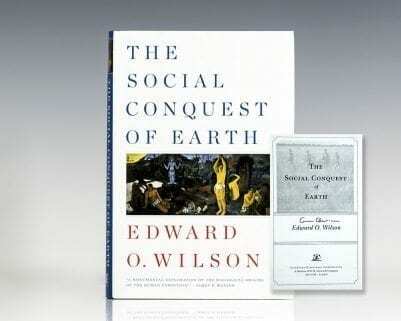 One wishes one could be reading it for the first time” (Barzun & Taylor 1142). 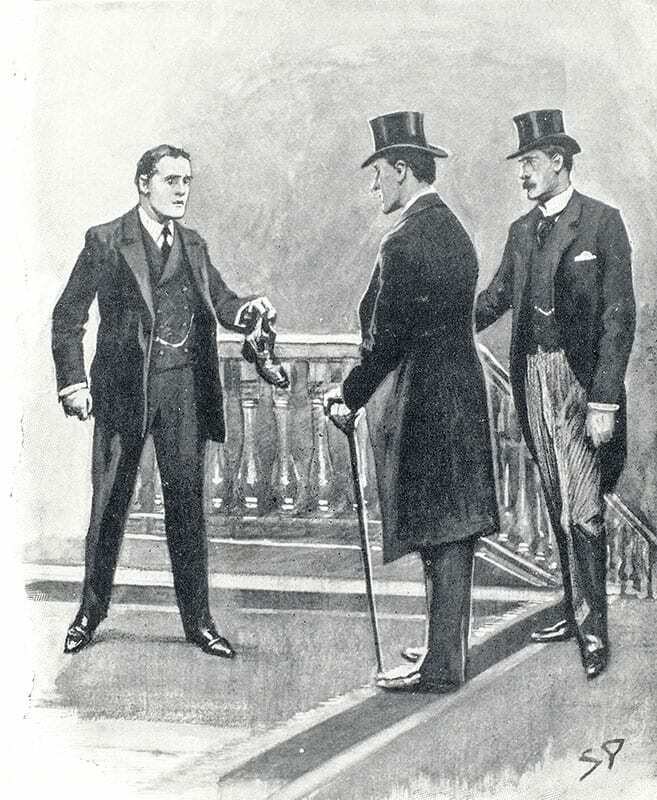 First edition, first issue of the third Sherlock Holmes novel, and widely considered as the best of the series. Octavo, original black and gilt stamped pictorial red cloth. Illustrated by Sidney Paget. In near fine condition with some rubbing to the spine and front panel. A nice example. New York: Harper & Brothers, Publishers, 1956. First edition, early printing. Octavo, original half black cloth, with eight pages of black-and-white photogravures. Inscribed by the author on the front free endpaper, “To Anthony Amari best regards John Kennedy.” Light rubbing to the bottom cloth, near fine in a very good dust jacket with some rubbing. Jacket design by Phil Grushkin. Foreword by Allan Nevins. Housed in a custom half morocco clamshell box.